Product #31792 | SKU PR22 | 0.0 (no ratings yet) Thanks for your rating! The black PR 22 Dynamic Cardioid Handheld Microphone from Heil Sound can be used to mic anything from vocals to snare drums. Heil has developed the patent-pending IsoBand technology, which uses a Sorbothane rubber suspension system in order to eliminate low frequency handling noise. 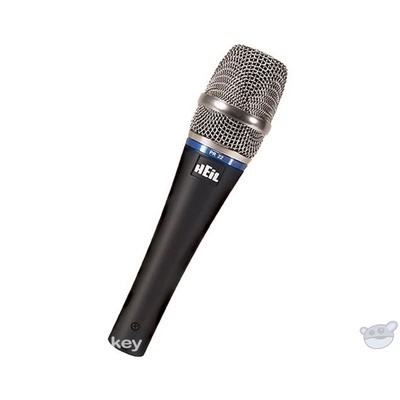 The mic uses a special low-mass NdFeB diaphragm and a large voice coil assembly to provide exceptional performance, including a cardioid pickup pattern with excellent off-axis rejection. The microphone produces a very linear pattern and reduces proximity effect. It can also be used in extremely high sound pressure applications, and is virtually immune to overload conditions. A leatherette carrying bag, microphone clip, and 3 metal windscreens (black, silver, and gold) are included.